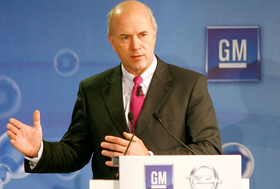 GM's Carl-Peter Forster said selling 2.04 million cars in 2008 was "a success in difficult times"
General Motors Europe sales fell 6.5 percent to just over 2 million new cars in 2008, the company said Friday. GM Europe's decline was faster than the overall European market, including Russia and Turkey, which the company said fell 5 percent to 21.98 million units. GMs market share in Europe fell from 9.4 percent to 9.2 per cent during the year. Opel/Vauxhall sales fell 10.5 percent to 1,629,000 units during the year, results that were blamed on the financial crisis spreading into key western markets like the UK and Spain. But GM said Opels sales in eastern Europe continued to grow, up 41 percent to 257,000 cars. Sales in Russia were up 49 percent to nearly 100,000 units. The worst affected GM brand was Saab, which saw sales fall 21.9 percent to 66,582 units. GM has now launched a review of the Swedish brand with options including a sale. Despite the downturn, Chevrolet increased its sales by 10.7 percent to 507,000 cars during the year. Cadillac sold 4,556 units, down 5 percent, Corvette sold 1,086 units, down 15.3 percent and Hummer sales were down 1.8 percent to 2,286 units. Forster said the company faced increasing headwinds heading into 2009.